We might all hope to be vindicated so quickly. I wrote yesterday morning of the way the Iraqi government’s sectarianism and authoritarianism had created the space among Iraqi Sunni Arabs in which the Islamic State of Iraq and Syria (ISIS) could operate, and that I saw no way out of this, so one should expect escalating violence, chaos, and killing. By midday, Mosul, Iraq’s third city after Baghdad and Basra, had fallen to ISIS. The extent of the ghanima (war booty) that ISIS has captured is uncertain but it certainly includes U.S.-supplied Humvees, small arms and ammunition to keep ISIS fighting for quite some time, and reportedly even helicopters. Whether there will turn out to be a pilot among ISIS’ ranks—they have drawn significantly on the remnants of the Saddam Hussein regime after all—we shall soon see. By the evening, this loot had turned up in Deir Ezzor, eastern Syria, in the hands of Abu Omar a-Shishani. Shishani is no ordinary takfiri zealot: he is a Chechen who previously led a group calling itself Jaysh al-Muhajireen wa-Ansar (Army of Emigrants and Helpers), which splintered late last year and his faction merged into ISIS. Shishani and his men frightened—and still do—even the Zarqawi’ists. The immediate-run effect is going to be that the rebellion and the Kurdish areas on the Eastern Front in Syria now come under tremendous pressure from ISIS. Iraq’s growing crisis is not due to the civil war in Syria or the infiltration of terrorist fighters from abroad. It is rather the fear that Kurds, Sunnis and Shiites have of each other. Each community feels that the others seek to oppress, if not massacre, it and will do so if given half a chance. They also fear a central government with unrestrained power, controlled by one of those communities—in other words, what the Maliki government has become. … That is why the Kurds are increasingly pushing toward independence. That is why a Sunni populace that triumphantly evicted Salafi terrorists in 2007-08 is now grudgingly accepting them back. The Syrian war has of course not helped; it has hardened sectarian lines through the region, Iraq does suffer spillover, and Syria has given the time and space for ISIS to train and establish themselves before launching this attack on Iraq. But had the Iraqis been united and the Sunni Arabs of Anbar—where Fallujah remains in ISIS’ hands—and now Ninawa been committed to a government they felt represented them, or at least their interests, then this could not have happened. The Iraqi government’s inability to suppress ISIS should be ascribed to incompetence not design but it should also be recognised that the conflict at the level it was before the fall of Mosul was a great help to Iraqi Prime Minister Nouri al-Maliki. With takfiris on the loose, it silenced internal dissidents in the Shi’a community and it reinvented his thuggish authoritarianism and sectarianism as guardianship: he was now the protector of his community. I am here in Lebanon where some of the bloom has come off Hizballah’s popularity because of their plunge into the Syrian war, but the Shi’a community has never been more united. The more sensible among them understand that it is Hizballah’s fault that there are bombings in Beirut but they now need the “Party of God” more than ever as a protector. This has played out in Iraq. 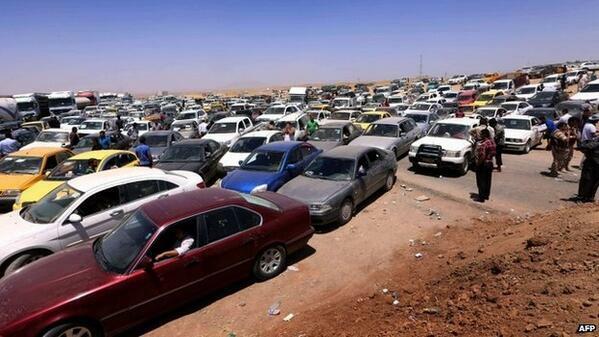 But with the fall of Mosul there will be murmurs that Maliki is not up to the job of protecting the Iraqi Shi’a. This disaster, however, does leave Maliki able to present the West with a straight choice of his sectarian autocracy or ISIS—not unlike the pattern of Syria. Even the Wall Street Journal editorial is convinced by this line of argument, lambasting Congress for having “slow-rolled the delivery of arms” to the Maliki government. The Journal is obviously correct that ISIS are non-negotiables but this completely misses the fact that—as Mao Zedong once put it—if insurgents are fish then the people are the sea in which they swim. ISIS could not be running riot in western and central Iraq without support from Iraqi Sunni Arabs, and ISIS have that support in part because of Maliki’s persecution of the Sunnis—marginalising them from government power and services, and inciting among them existential fears with his use of Khomeini’ist killer squads alongside his national army. The Journal is also right that at this point there is little choice but to supply the Maliki government with weapons: ISIS have to be checked, even if they are symptom rather than cause of the instability in Mesopotamia. Pollack’s suggestion for very stringent conditions on such aid—possible because of the desperation of Maliki—should be taken up, primary among them a constitutional amendment that puts a two-term limit on the premiership, specific outlines for the defence and security positions that would separate them from the Prime Minister’s office, and increased representation for the Sunni Arabs. The crucial thing now is not to be drawn in by the Iranian theocracy’s attempt to capitalise on this. The Iranian regime has argued—with considerable success—to the Obama administration that the real threat in the region is Sunni jihadism of the Qaeda type. The Iranian regime’s own long relationship with al-Qaeda is overlooked in this picture, as is its client’s collusion with such forces, as is the fact that Iran is a jihadist regime pursuing nuclear weapons. This dwarfs any problem from the trans-national Salafi-jihadist networks, even ones that border Turkey and can make an easy transit to borderless Europe and thence to the United States. Americans might be pleased at their own decreasing reliance on Middle Eastern oil but Europe’s reliance is not decreasing and, unless America is proposing to entirely withdraw from the world, something she cannot do since the world will not leave her alone, then Europe remains the linchpin of her entire global presence. To allow clerical Iran to dominate the region—which is what it would do with nuclear weapons—and set the price of oil would be catastrophic, to say nothing of the proliferation of nuclear weapons across the region, the aggression Tehran would be able to launch with impunity (Bahrain would be a primary target), and the stand-off with Israel that would not end peacefully. But indications are that President Obama thinks rapprochement with Iran—deliberately increasing their power in the region against the Sunni Gulf States to achieve a “balance”—is his way out of the region. Hizballah has been given CIA intelligence on impending attacks against them by Salafi nasties, and now U.S. support is being given to the Lebanese Armed Forces (LAF), which is under the functional control of the Hizballah. Over Syria, Obama has refused to seriously arm or train the rebellion so it can depose the regime, and we know why: because Iran was implicitly promised a free-hand in Syria in return for delaying its nuclear ambitions. Obama does not want an outright rebel/Gulf victory; he wants a negotiated settlement (which would require the functional defeat of the regime) to “balance” Iran’s desires against the Khaliji States. If Obama now provides unconditional aid to the Iraqi government it will intensify, not pacify, the conflict. There is something of an imbalance in the furore over ISIS capturing a few American Humvees when Iran’s proxies have penetrated an entire security apparatus in Iraq that has been supplied with thousands of them. Giving weapons to Khomeini’ists is not a road to peace. The final consideration is the Iraqi Kurds. The Peshmerga will almost certainly intervene in one way or another in Arab Iraq to arrest the carnage and expel ISIS. There being no other alternatives, this seems like the right course. The Obama administration has treated the Iraqi Kurds shabbily: abandoning them to deal with Baghdad without the American intermediary was one thing, but Washington has since then sought to impede their development of their area, especially independent oil sales to Turkey. A moment of satisfaction then for the Iraqi Kurds, who like so many American allies found themselves maligned in the Obama years: now suddenly they are being deputised to take the fight to the takfiris—and their armed forces, which some in the U.S. wanted to disband, are being praised by the State Department. If the Kurds do undertake operations at American direction they potentially have the ability to secure recompense at least on the oil issue and perhaps also on their evolution toward independence, which was coming anyway and which has been made all-but certain by yesterday’s events, which are in themselves a mortal blow to the “Sykes-Picot” order. The danger is that the Kurds overreach. The internal Iraqi border de facto puts some areas of northern Ninawa, Diyala, and Kirkuk in the Kurdish area. If the Kurds try to settle the Kirkuk Question by seizing the city after they remove ISIS then a wider war looms. The Kurds have a very good case for Kirkuk but it has to be made democratically and by compromise. The Kurds cannot reverse the “Arabization” and injustice done to them by force without sparking a wider war and further bloodshed. This entry was posted in Iraq and tagged ghanima, Iran, Iraq, Iraqi government, ISIS, Kirkuk, Kurds, Maliki, Mosul, Nouri al-Maliki, Omar al-Shishani, Peshmerga, President Obama, PYD, Rojava, Sunni Arabs, Syria, YPG on June 11, 2014 by KyleWOrton. Kurds have all legitimate rights to take their lands back. Why do all other nations get support in this same act while kurds not? There will be no more bloodshed after great Kurdistan is created. We got killed all this time but no one said that this is a massacre but just because other nations die we , Kurds, are to blame? No dear! We won’t give up. This is kurdish land. Our ancestors shed a lot of blood because of our freedom. We Kurds have all rights to declare independence. Thanks for the Article bro.